Renew your membership for 2019! 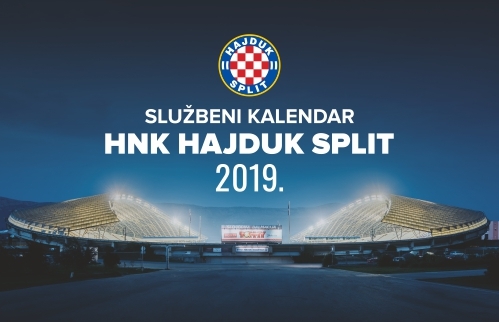 All news related to the topic "Hajduk - Rudeš 3-0 (Split, 16/3/2019)"
90+3 End of the match at Poljud, Hajduk beat Rudeš 3:0. Well done! 90+1 GOOOOOOOOOOOOOOAAAL 3:0 Caktaš! Hajduk scored from a quick counterattack. Jario dribbled passed Rudeš's defender and passed to Caktaš, who scored from 13 meters. 90 Three minutes of added time. 90 Svatok cautioned twice in two minutes and sent off. 87 Rudeš making last substitution, Jukić on, Halilović off. 86 Hajduk's last substitution Kalik instead of Tudor. 80 GOOOOOOOOOOAAAL 2:0 Jairo! Jradi passed to Jario from the right and he shot to the left side of the goal, goalkeeper couldn't save. 77 Caktaš took a free kick from some 20 meters, but it went wide. 75 Jairo crossed along the left wing and tried to pass to Delić, who was coming from the opposite side, goalkeeper Banić reacted on time. 71 Delić alone in the penalty box, he shot from 14 meters but it went wide. 69 Rudeš's substitution, Božić on, Kovačević off. 69 Hajduk substituting Tahiraj for Delić. 61 Rudeš making substitution, Barić on, Pasariček off. 61 Juranović shot from 17 meters, Posavec saves. Corner kick for Rudeš. 58 Jurić on, Palaversa off for Hajduk. There are 11239 spectators at Poljud today, of which 1023 on the Family stand! Thank you! 50 Pasariček passed to Lisakovich, whose shot went wide. 47 Lisakovich shot from 17 meters, Posavec saved. 46 The second half has started at Poljud. No substitutions during the half-time. 45+2 End of the first half. 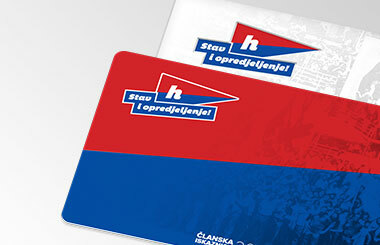 Hajduk lead 1:0, Mijo Caktaš scored in the 32nd minute. 45 Tahiraj passed to Jairo, his shot was not on target. 42 Pasariček passed to Kovačević, who shot from some 15 meters, Posavec was in place but this attempt went wide in the end. 37 Rudeš's goalkeeper found Lisakovich, who immediately shot, but this attempt went wide. 32 GOOOOOOOOOOOOAAAAL 1:0 Caktaš! 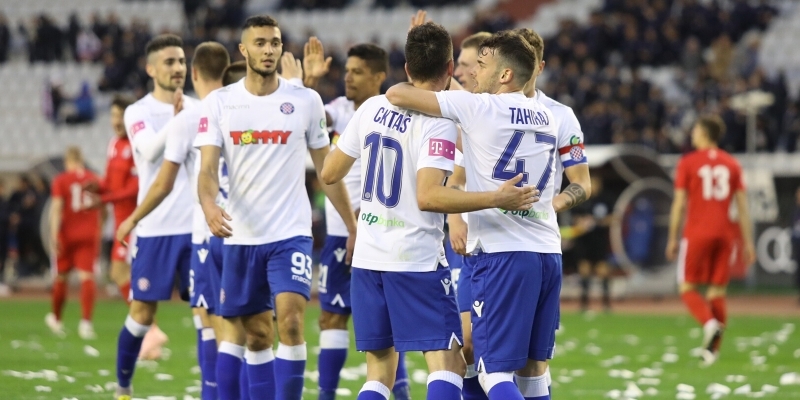 Nejašmić sent a long pass, some player of Rudeš cleared the danger but Tahiraj got to the ball first and shot on goal, Caktaš was right in front of the goal and hit the ball inside the goal. 30 Caktaš passed to Bradarić. whose attempt from 15 meters went wide. 28 Palaversa sent a long pass to Tahiraj but he didn't manage to shoot on goal. 23 Jradi shot from 18 meters, wide. 17 Caktaš's attempt ended up on the outside of the goal net. 15 Tahiraj passed to Caktaš, goalkeeper Banić blocks his attempt. 11 Kovačević shot from 19 meters, Josip Posavec saved. 9 Jradi jshot from 10 meters but it didn't enter the goal, then Tudor shot from 18 meters and it went wide. 5 Jairo slipped in the moment when he was planning to shoot on goal. 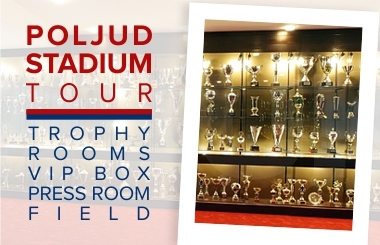 1 The match at Poljud has kicked-off, good luck Hajduk!! !